Regular readers who have been with me for a while may remember that over the last couple of years I have had the pleasure of reviewing Weekend Boxes. The idea behind the company is one close to my heart - helping families spend quality time together in the increasingly limited time they have together. 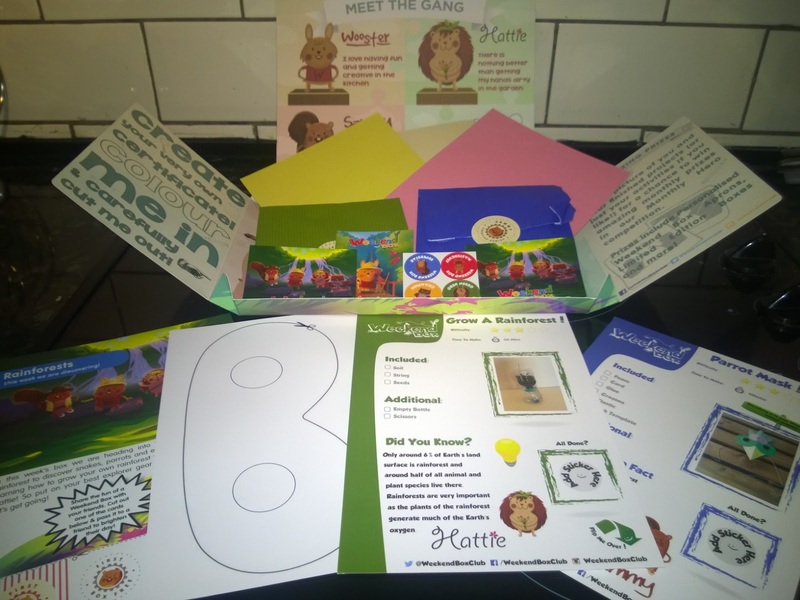 The concept is that families receive a fortnightly mailed box containing four themed activities, including all the resources required (except the odd basic supply such as scissors). This week we were very happy to review the Mini Weekend Box, inspired by families who weren't finding time to complete all four activities. Same great mailing but this time with two activities instead of four, and for a reduced cost compared to the original box. I have always been impressed by how the company listens to it's customers and reviewers - for example I mentioned after my last box that the glue stick provided didn't work well, and I see that in the current box the glue has been replaced by a much better one. The boys were jumping with excitement when they realised that they had a new Weekend Box to try. Impressively they still remember the activities they did for the last one we reviewed with a Chinese New Year theme last year. The theme of this box is Rainforests, and both the activities supplied were well thought out with this theme in mind. 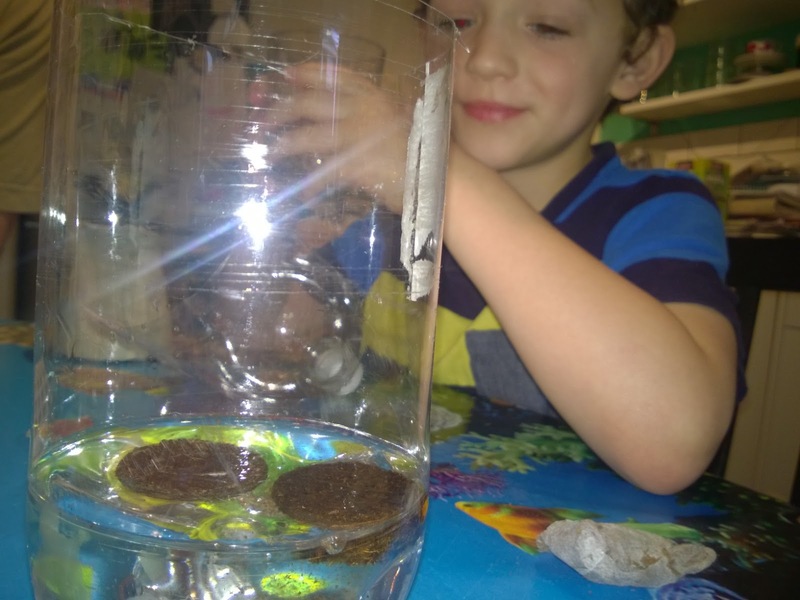 The first activity was a green-fingered challenge to grow our own rain forest. We received everything we needed except scissors and a plastic drinks bottle, but these were easily found in our craft supplies box (although our bottle may have been a bit big compared to the one on the instruction card). 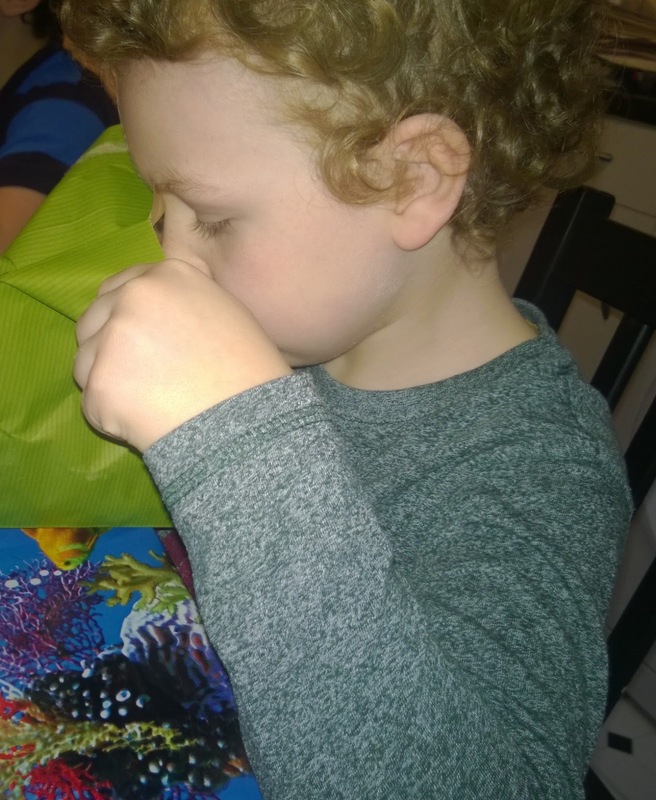 Toby was in charge of opening the envelope containing the supplies and passing them to Ollie as needed. Ollie did the trickier bits such as cutting the bottle in half. I was really pleased to see soil provided in the form of compressed dehydrated soil pellets (as I didn't fancy braving the rain outside with a trowel to dig some out of a flower pot). We could have done with a suggested quantity of water to add to the soil pellets as we were a bit overenthusiastic with it and ended up with a swamp. This was easily fixed however. Watching the pellets of soil re-hydrate was a source of great interest to the boys as they magically swelled to fill the container. A little help from Matt to make a hole in the bottle top using a corkscrew, and to thread through the string provided to make a self-watering wick, and the boys were ready to spoon the rehydrated soil out of the bottom of the bottle and into the top. We lost the seeds for a few minutes - the two little tomato seeds in a small plastic bag were overlooked at first inside the paper envelope the supplies came in. 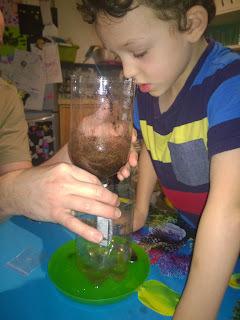 Once located the boys carefully planted one each and placed their Rainforest-in-the-making on the kitchen window sill to grow. I loved the idea of using recycled materials to create something new and I have to say we immediately decided that if this works we are going to try to grow seedlings for our allotment in this way - no worries about seedlings running out of water or becoming too damp. I also liked that apart from a tiny plastic bag, all the materials for this activity were recycled or recyclable, which is part of the company ethos for Weekend Box. 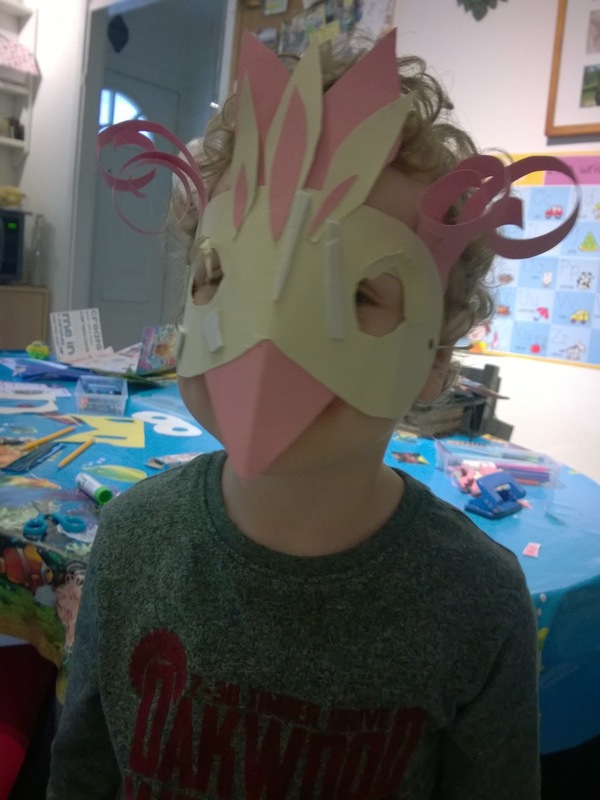 The next Rainforest themed activity was to make a parrot mask. 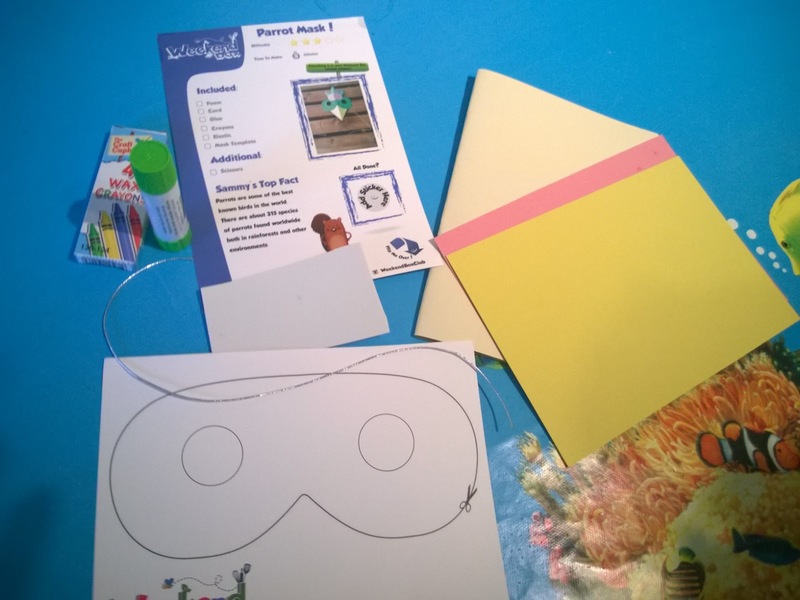 In theory the materials are provided to make one mask, but we found that by tracing around the card outline provided onto another piece of card in the kit, we had ample supplies to make masks with both our boys. The only thing I added was an extra piece of elastic from my sewing box to double up our mask making fun. We've found in the past that it is the case that an activity designed for one use can easily be extended for either more than one use or for more than one child. These activities were perfect for a wet Saturday morning when we had an hour spare (I had to wait in because I had an OU tutorial mid-morning). 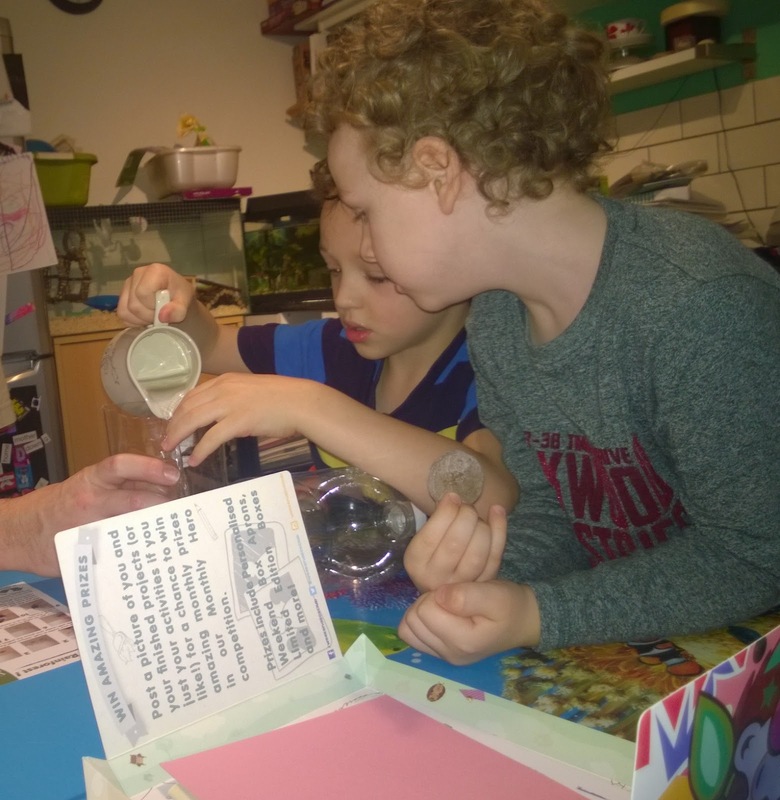 The boys really enjoyed sitting down to activities as a whole family - often it will be one parent doing activities with the kids while the other gets on with something else. 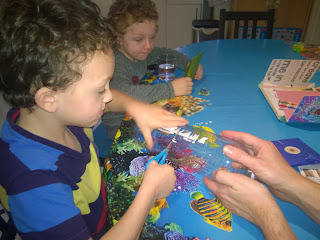 The boys were both feeling a bit tired and under the weather after a busy week too, so this was an ideal way to play together while still having a rest. We all liked the way that this activity was laid out with suggestions to follow and an example of a completed mask, but really could follow any flight of fancy the boys wanted. Cream, pink and yellow card were provided, as well as some white foam, crayons, a length of elastic and a glue stick, but we also found the paper envelopes that the activities came in were a good additional resource when Ollie wanted some blue feathers for his parrot. 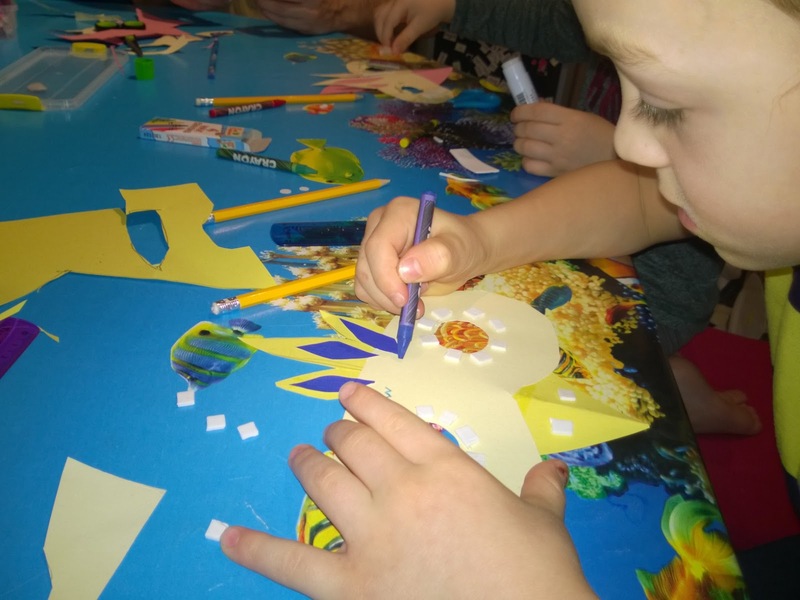 The activities provided were both engaging and fun, and would suit a range of pre-school and primary ages with differentiated levels of adult assistance. They have been designed to be educational, and from past reviews of their products I have found that they stimulated further discussion and activities for a long period after the activities were completed. 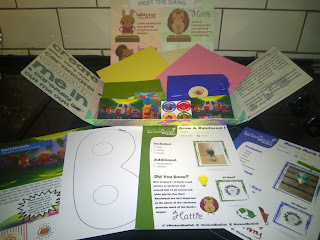 The box came with a selection of stickers, a fun facts card with jokes and information about the Rainforest theme, plus tokens to give to friends to try out a box for free. If you would like to try a box you can use the promo code MARIANNE59 when you sign up to receive your first box free. The new Mini Weekend Box is £4.95 including free delivery, and all boxes are delivered fortnightly with no contract and no obligation to continue - you can cancel at any time. For this reason I can see it being something that could be ordered during holiday periods when parents often need a little help thinking of new activities to share, even if they feel weekends are too squeezed during the rest of the year to find an extra hour together. I think the mini box was very suited to our uses because we already spend a lot of time making and doing, but being provided with a ready made kit which is often themed to match key celebrations such as Mothers Day is a good way to take the brain work out of planning activities on the weekend when we're in need of a rest. I think it would also be very useful for families who lack space for make and do box clutter (we're currently over running a double cupboard and a set of draws with paint, paper, boxes, bits of string...) - pretty much everything you need is provided in the box. This would also make it useful for children visiting extended family such as Grandparents and parents with shared access who are looking for a new tradition to start of doing projects on 'their' weekend together. Note: I received a free Mini Weekend Box to try out with the kids in return for an honest review, and have reviewed two other boxes in the past, all of which have arrived on the expected day, all have fitted through the letterbox, and all been in good condition and with good contents. The opinions and images are all my own. If you have tried Weekend Boxes in the past, or have any questions or comments do let me know below, or on The Maz Shack's Facebook Page.